Sports Car Services relies heavily on an in-house new parts inventory of about 2,400 part numbers for Jaguar, MG, Austin Healey, Triumph and some others. The depth of our inventory is what allows us to perform both thorough and complete repairs. We operate an overnight parts service for other repair shops as well as individuals, and have a daily UPS pick up in the afternoon. 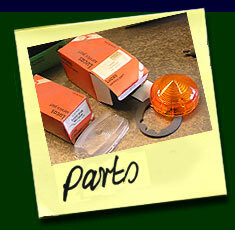 If you're having difficulty finding a part, or you're just looking for a better part, we're happy to help. We also hold stocks of used parts, primarily for MG's, which in many cases are superior to the currently available replacement items. Credit cards are always cheerfully accepted, as well as C.O.D's by prior arrangement.